Transmission Rails is a rock music project composed of John Moulder, Stef Flaming and Colin Tench. Has been around music all his life. He started writing poetry in 1979 which developed into songwriting stints in Nashville in the early 2000’s. His work has been described by readers as some of the most beautiful they’ve ever read. John is a musician as well, a composer, who lays down the framework on how his writing is meant to be heard. With a musician as father who hammered the music in his head since he was a kid, he wanted to be a drummer, but that was a bridge too far for his parents who were living in the centre of a little city. So he started to play the guitar, and became guitarist in metal bands such as Chronic Death and Argelterp. Inspired by the great classic rock bands from the 60’s and the 70’s he started to write his own songs, which developed into a unique style, a blend of classic rock, prog and metal. Currently he is the singer/guitarist in the band Murky Red for who he writes the music, and he is also bassist in the band Oceans 5. After he got rid of his diapers he started to play the guitar. He played in the early 80′s in a young, promising band called Odin of London, but as live opportunities dried up Odin disbanded. With some friends he formed a new band, Bun Chakeze. No labels showed an interest at the time though, and Bun Chakeze went into a hiatus of sorts. Fast forward some 20 years in 2010, with a slight name change, now using the moniker BunChakeze, they decided to release the album themselves. 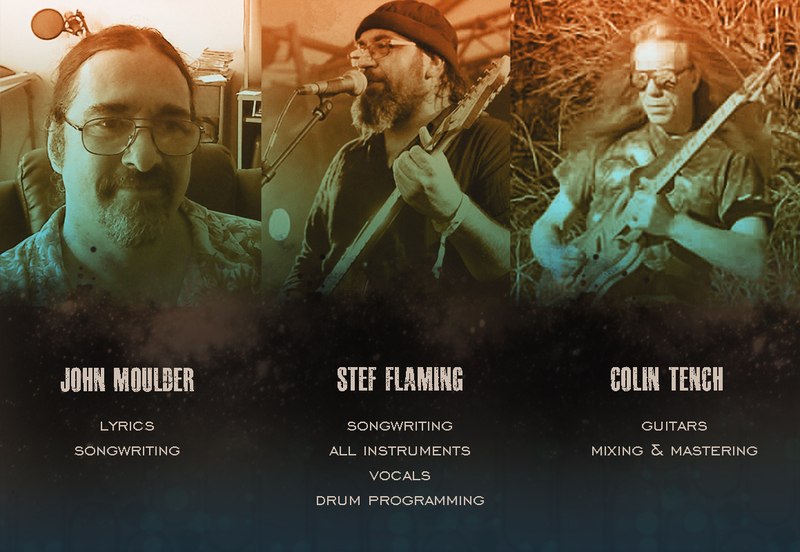 Currently Colin is also involved in bands such as Corvus Stone and Oceans 5. John and Stef ‘met’ each other on Facebook somewhere at the end of 2012. Soon they discovered that they had the same musical taste. John listened to Stef’s band ‘Murky Red’ and he loved what he heard. An idea came up in his mind. But nothing happened, not yet. The more John and Stef talked with each other, the more they realized that they shared the same musical preferences, humor, vision,… John wanted Stef to write the music for his lyrics, so one day in 2013, he sent Stef the first lyrics, soon followed by lots of other ones, asking him: ‘okay mate, make something great out of it’. It was a challenge for Stef, who’s used to write his own lyrics. But he liked the way John writes, and knew immediately that he never could write such poetry as John does. In the beginning it was hard, because Stef used to write the music before the lyrics, and John’s poetry consisted in long and short sentences, which were not easy to go along with the music. But as soon as they knew how to proceed, they started to work as a great team. John adapted his lyrics to the music, Stef adapted the music to the lyrics. But Stef was also thinking to involve another musician. He didn’t have to think twice: it had to be Colin, his long time friend and top guitarist. Colin and Stef never needed much words to understand each other, and so Colin added his guitar parts to the tracks. The combination of these three talents proved a hit: John, Stef and Colin realized that they created something unique. And their child got his own name: ‘Transmission Rails’. A new band was born. The first track, the rock ballad ‘Books’, is with living legend Joe Vitale as guest drummer. There are plans in the make for cooperation with other guest musicians.